Some of the state's political leaders, including House Speaker Joe Straus and Lt. Gov. Dan Patrick, took the unusual step Friday afternoon of declining to set the state’s spending cap after calling a meeting to do just that. Straus and Patrick met Friday meeting in their role as part of the 10-member Legislative Budget Board, a group whose responsibilities include setting a limit each session for how large the next two-year budget can be based on projections of Texans’ personal income growth. Straus told reporters he wanted to give the next speaker more time to consider his options, noting that the board had similarly postponed a spending cap decision in 2006. 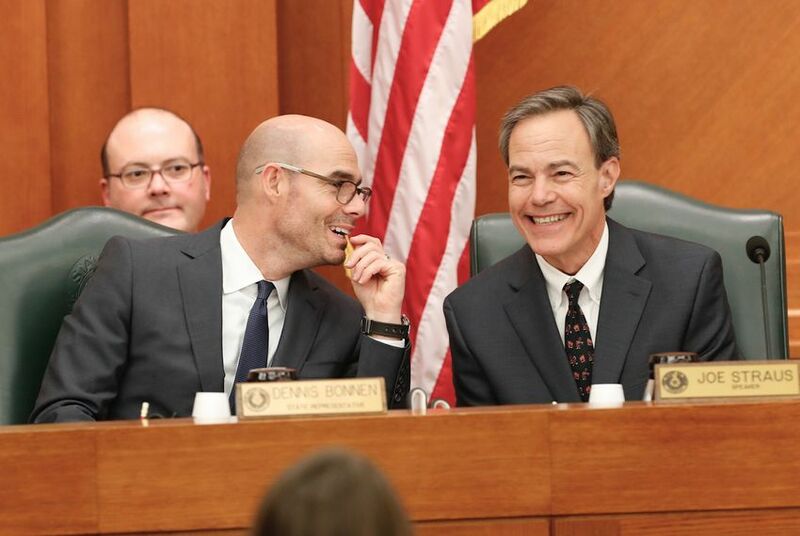 State Rep. Dennis Bonnen, who has drawn the support of most of the state House to become the next speaker, was also at the meeting as another member of the Legislative Budget Board, but did not comment on Straus' decision. The Texas Constitution requires that certain spending in the budget can't grow faster than the state's economy, but doesn't specify how to measure that growth. State lawmakers have long used projections of personal income growth as a proxy. The 10-member budget board fielded growth estimates from the comptroller's office and four other financial forecasters, all of whom projected a growth rate for the state between 8 and 11 percent. The spending cap only covers nondedicated revenue, those parts of the budget that are funded by taxes but are not required by law to go to specific programs. While the Legislature can vote to break the cap, it's a politically dicey move that lawmakers have worked to avoid in recent years. In 2016, facing a sluggish economy, the budget board adopted a spending cap of 8 percent, limiting the state's spending covered under the cap at about $100 billion. But actual state spending for that budget cycle, which is ongoing through most of next year, is expected to be well below that amount. Lawmakers will pass a supplemental budget when they meet in 2019, to plug leftover holes in state spending in the current budget cycle and to address additional costs from Hurricane Harvey. Tom Currah, the chief revenue estimator for the Texas comptroller, told the board that the state’s unemployment rate of 3.7 percent was “the lowest it’s been” and that lawmakers should “expect continued economic growth.” In January, the comptroller will issue an estimate for how much tax revenue the state expects to collect over the next budget cycle.